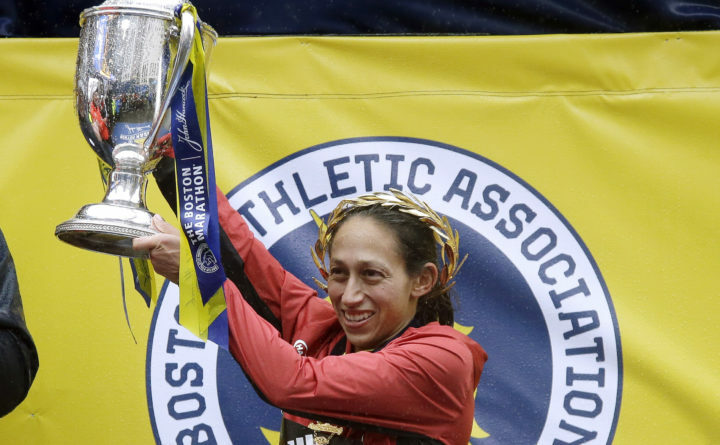 Desiree Linden, of Washington, Michigan, hoists the trophy after winning the women's division of the 122nd Boston Marathon on Monday, April 16, 2018, in Boston. She is the first American woman to win the race since 1985. 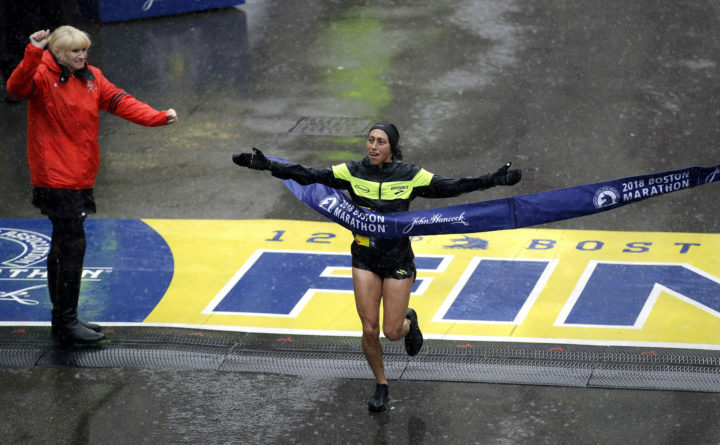 Desiree Linden, of Washington, Michigan, wins the women's division of the 122nd Boston Marathon on Monday in Boston. She is the first American woman to win the race since 1985. Brutal conditions? A nasty headwind? A chilly rain? None of those things stopped Desiree Linden, who became the first American woman to win the Boston since 1985, streaking away from the field. Linden, a 34-year-old Californian, overcame the heartbreak of 2011, when she finished second in the marathon by two seconds, and won in an unofficial time of 2:39:54. Linden, a veteran long-distance runner who competed in the 2012 and 2016 Olympics, finished ahead of Kenya’s Gladys Chesir and, along the way, helped fellow American Shalane Flanagan get back in the race after a rest-stop detour delayed her. Linden told boston.com that she likes to bide her time until around the 30K mark for the marathon, then make a move. That’s just what she did Monday. “It’s kind of like the blinders go up at that point,” she said. The last American women’s winner in Boston? Lisa Larsen Rainsberger (then competing as Lisa Larsen Weidenbach). It was a nasty day for a race, with officials announcing that the temperature of 38 degrees at the 8:40 a.m. Eastern time start in Hopkinton, Massachusetts, made this the coldest start in 30 years. That meant that runners were coping with a different kind of misery this year, after last year’s 80-degree temperatures. Runners may love temperatures in the 40s, but not when rain and a blustery wind is added. Just look at Galen Rupp, who finished second in the elite men’s field last year. He had a unique approach Monday to staying warm, bundling up like he was about to rob a bank. Shortly before 11 a.m., the first competitor crossed the finish line. Marcel Eric Hug of Switzerland won his fourth consecutive title in the men’s push rim wheelchair race in an unofficial time of 1:41:49, the slowest time in 31 years. Tatyana McFadden won her fifth women’s push rim wheelchair title and her 22nd overall in world marathon majors, the most of any women’s wheelchair athlete. McFadden’s unofficial time was 2:04:39, the slowest in 30 years. The field of 29,960 athletes includes runners from all 50 states (4,921 from Massachusetts) and 109 countries. You can find runners by searching the field at BAA.org. At least five openly transgender women have signed up to run the race, and a BAA official told Runner’s World that race officials and volunteers would compare gender identity on the government-issued ID required to pick up a bib number with what’s on runners’ entries.